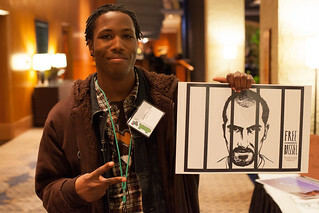 If you subscribe to Creative Commons’ newsletter or follow us on Twitter and Facebook, you’re likely familiar with the story of Bassel Khartabil, our friend and longtime CC volunteer who’s been in prison in Syria since March 2012. Today, on the second birthday that Bassel has spent in prison, friends of Bassel and members of the open community are taking a moment to reflect on his situation and call for his release. Artist and filmmaker Niki Korth recently developed a game that uses quotations from Bassel to start conversations about free and open communication, the conflict in Syria, and other topics. Niki has been publishing the playing cards online as well as videos of people playing the game. Earlier this week, Niki led a few of us at CC in the game. You can watch our responses to several of her questions on her Vimeo page. Thank you for this post. It felt sympathy and sorrow for this young man’s situation. He was to have been married in April 2012! He should be celebrating his wedding anniversary, not be detained in prison, with no charges, no known date of release! I read the Fabricatorz post (not such a good website name, as the word has dual meanings, one of which does not connote trust), as well as the excellent Etherpad entry on Mozilla, titled “freebassel”. Per the Etherpad post, I will update Bassel’s Wikipedia article (it was listed as an action item). I perused the article change history briefly. The article is definitely tended with care and respect. I found one notable omission, which I will rectify, along with the supporting source reference. I’ll keep an eye on Bassel’s page, and think of him when I say a little barucha tonight. Please update the CreativeCommons weblog, if favorable news regarding Bassel’s status becomes available? P.S. I noticed that Bassel was a regular contributor to Wikipedia. I wonder if its foundation, WMF, could assist in propagating Bassel’s situation, so that it receive more public attention? That was a concern mentioned in other posts, how no one is aware (including me, until now).